Gloomy indie rock stadium fillers the National have revealed that a follow-up to 2013's Trouble Will Find Me is in the works. In an interview with NME, frontman Matt Berninger divulged that the band is in the process of writing a new record and have already amassed 30 potential new songs. "We did a camp out retreat in New York a couple of months ago, and we're having another one in LA in a few weeks," he told the UK publication. "We have 30 sketches of songs so far." Speaking to Exclaim! 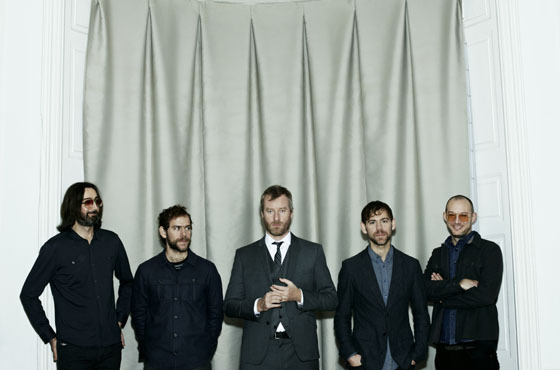 in 2013, Berninger described the band's creative process. "Aaron and Bryce [Dessner] will send little music ideas and I will put them into my laptop and start singing along with my headphones on," he said. "We don't get together and write together in a room, we never have. Later, we craft the songs together in a room. We polish them and we develop them together, but we usually work separately for a big part of it." Apparently, Aaron has been naming the new in-progress tunes after towns in upstate New York — a tactic he's employed before. "Before, he's named them after things like civil wars," Berninger told NME. "All the songs that turned into Trouble Will Find Me were named after children of our friends." It may be unlikely that anything named "Albany" or "Poughkeepsie" will make the final cut of the forthcoming, but at least with the promise of new tunes on the way, fans of the National will be able to take a break from listening to "Sorrow" on repeat for six hours at a time. Berninger will also release his collaborative debut with Menomena's Brent Knopf later this year. Under the moniker EL VY, the duo will release Return to the Moon through 4AD on October 30.